Sources claim Caitlyn Jenner is already planning to steal the show at next year's Met Gala. HOT ‘N HUSH-HUSH trans-Jenner scoop: America’s about-to-be sweetheart Bruce Jenner’s going for the GOLD again – he’ll star in a super-splashy, first-time public grand entrance as a WOMAN at next season’s Met Gala super-bash – strolling the red carpet in an eye-dazzling designer gown on the arms of Kim Kardashian and Kanye West! 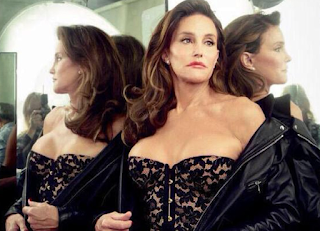 Said my source: “They’re really trying to keep it secret, but Bruce will make his super-grand entrance as a woman at the next Met Gala, the fashion world’s top event, on the arms of step-daughter Kim and husband Kanye! "The idea’s their brainchild – and when they told Bruce, he practically cried with happiness. It means KimYe accept him unconditionally – but even more touching: They’re collaborating with a top designer to create a one-of-a-kind art-piece gown that’ll make their statuesque Olympian dazzle from here to eternity!